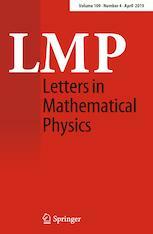 The aim of Letters in Mathematical Physics is to attract the community's attention on important and original developments in the area of mathematical physics and contemporary theoretical physics. The journal publishes letters and longer research articles, occasionally also articles containing topical reviews. We are committed to both fast publication and careful refereeing. In addition, the journal offers important contributions to modern mathematics in fields which have a potential physical application, and important developments in theoretical physics which have potential mathematical impact.